The Miami Hurricanes lost to the Duke Blue Devils Saturday, 48-30. Corn Elder #29 of the Miami Hurricanes makes a diving tackle to stop Jamison Crowder #3 of the Duke Blue Devils during play at Wallace Wade Stadium on November 16, 2013 in Durham, North Carolina. Brandon Connette rushed for a career-high four touchdowns and threw for a fifth, and Duke upset No. 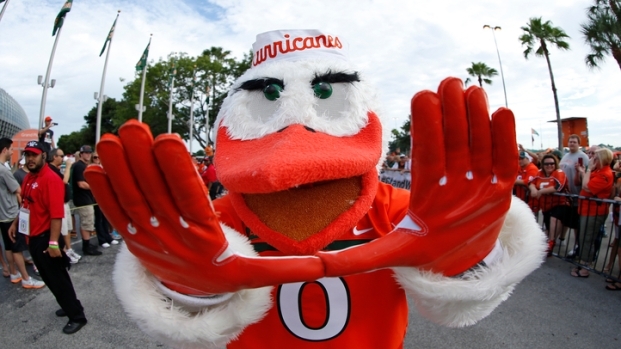 24 Miami 48-30 on Saturday to take sole possession of first place in the ACC's messy Coastal Division. The Blue Devils' change-of-pace quarterback had touchdown runs of 1, 2, 3 and 4 yards, and threw a 22-yard TD to Shaq Powell while leading Duke (8-2, 4-2) to one of the program's most significant wins. Josh Snead rushed for a career-high 138 yards and Powell added a backbreaking 33-yard touchdown run that put the Blue Devils in complete control. Dallas Crawford rushed for 115 yards and Stephen Morris threw for 379 and two touchdowns but the Hurricanes (7-3, 3-3) lost their third straight. In a wild game that featured 1,108 total yards and three lead changes, Duke claimed the inside track to a berth opposite No. 2 Florida State in the ACC championship game. Ross Martin gave Duke the lead for good late in the third quarter when he banked in a 48-yard field goal off the upright late to make it 31-30. Two possessions later — and two plays after Snead burst 56 yards into the Miami red zone — Connette powered in from 4 yards out to put the Blue Devils up 38-30 with 11:37 left. Powell then iced the win on Duke's next possession when his 33-yard touchdown run on fourth-and-1 gave the Blue Devils a 45-30 lead with 6:50 left. After Miami turned the ball over on downs, Martin added a 32-yard field goal with 1:04 left. Morris finished 30 of 49 with touchdowns of 50 and 5 yards to Herb Waters. Stacy Coley returned a punt 79 yards for a touchdown and Matt Goudis added three field goals. But the Hurricanes couldn't stop Duke's ground game: The Blue Devils rolled up 358 yards rushing — by far, the most by a David Cutcliffe-coached team — against a Miami run defense that gives up an average of 152. Connette, who often spells starter Anthony Boone in short-yardage situations, became the first Duke player to rush for four touchdowns since Justin Boyle did it against Vanderbilt in 2006. Boone — who improved to 8-0 as a starter — was 11 of 15 for 104 yards for Duke, which continued its remarkable turnaround from perennial cellar-dweller to serious Coastal contender. The Blue Devils went winless four times from 1996-2007 with two more one-win seasons in that span. They've already locked up their first winning season since 1994 and now they've beaten two Top 25 teams in the same year for the first time since 1971. The Blue Devils fell behind 17-7 on Morris' short TD to Waters late in the first quarter, but outscored Miami 41-13 after Deondre Singleton's momentum-changing interception early in the second. Connette accounted for touchdowns on three of the four possessions after that.